i lost my first racing competition because of lesser power motor and in efficient driver circuit. i worked on it a lot and finally found some solutions. and wheel of maximum possible grip. solution 2: use proper motor driving technique. solution3: make strong chases with light weight with maximum possible ground clearance. solution4: use proper battery with less size and more power that works for longer period. Using this platform i made a robot gun tank. Now a day’s security plays crucial role in any country. So many soldiers are sacrificing their lives for the sake of the country. But the technology is changing day by day. A new area began in the field of science. That is ROBOTICS. Several researches were under taken in the field of robotics. Robots are being used in different fields where there is a difficulty to the humans. Robots can be used even in the field of defense. If we lose a robot we can replace it with another one but we cannot replace a soldier with another. Many countries started using robots in the wars. For example USA recently developed a robot called SWARD which can carry a rifle and fire at the destined targets. We tried to make a robot that will be faster enough to serve the soldiers in the battle field. We implemented this project using two micro controllers 8051 at the transmitter and ATmega16L at the receiver. 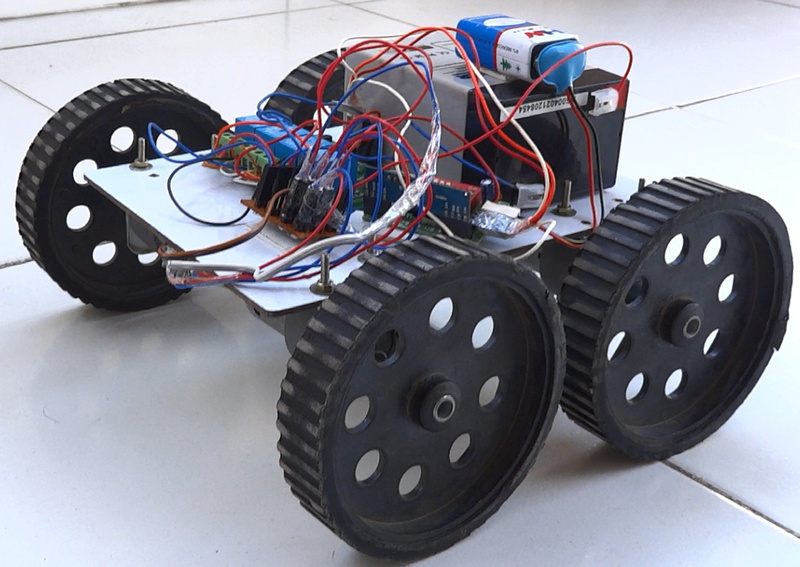 The robot platform is based on the high performance Jonson-H motors. This robot can be operated through remote through RF communication by using encoder and decoder at the transmitter and receiver with 8bit secured address. This kind of robots helps the soldiers by making some modifications in the robot we can make it to carry the goods at the battle fields to help the soldiers. 1000RPM 12V DC geared motors for robotics applications. It gives a massive torque of 12Kgcm. The motor comes with metal gearbox and off-centered shaft. Shaft has a metal bushing for wear Resistance. when there is no current flowing in the coil the switch will be as shown in the figure.that means in normal state there will be connection between "common" and "contact". when ever current is flowing in the coil the core is magnetized and attracts the switch.so the switch will be moved towards "non contact". so a connection will be established between "NC" and "CM". 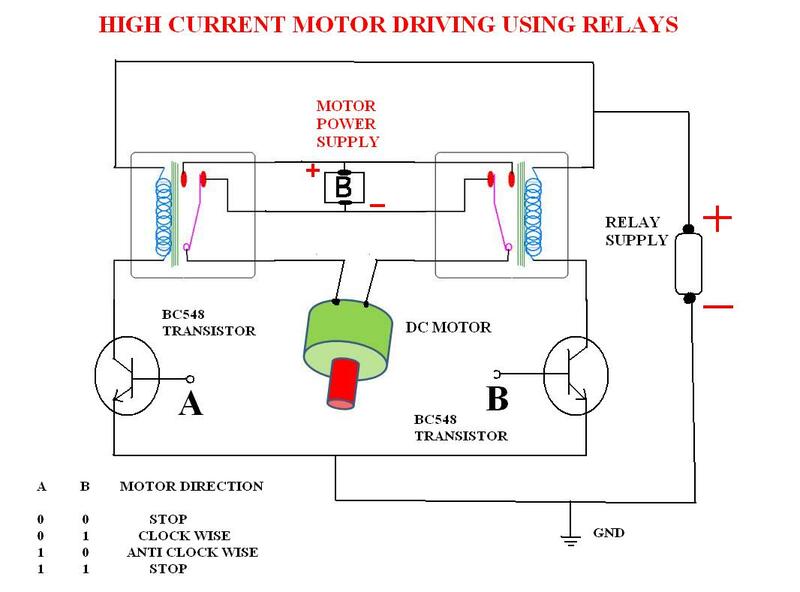 the circuit for connecting relays will be as follows. the following circuit is a high current motor driver using relays. actually we are implementing a H-bridge using the relays. when ever a logic "1" is applied to the transistor base then the corresponding relay will be activated .it will be very simple mechanism. if you are using more than one motor i prefer you to use a ULN2003 IC for driving relays.one ULN2003 can drive "7" relays. so that you can control "3" motors with still one left.if you use two ICs you can control "7" motors. Dear sir, please guide me to make this robot.. i really want to make this robot... fast racing car with 4 motors and yes wireless!! !